What is it about penguins that just makes people happy?! Our penguins are no exception. They provide endless entertainment with their walking, swimming, diving, and all-around “personality." But for us, penguins are also serious business. 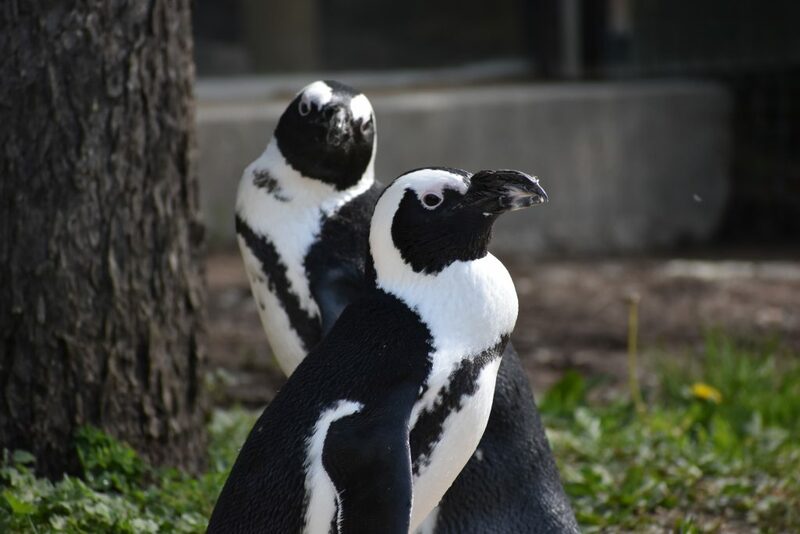 We participate in the Species Survival Plans for the African penguins as part of our membership in AZA. We hope to someday have chicks. But, for now, we celebrate seven healthy birds! The penguin body is perfect for life in the water. Its streamlined shape causes very little resistance as the penguin moves through the sea. 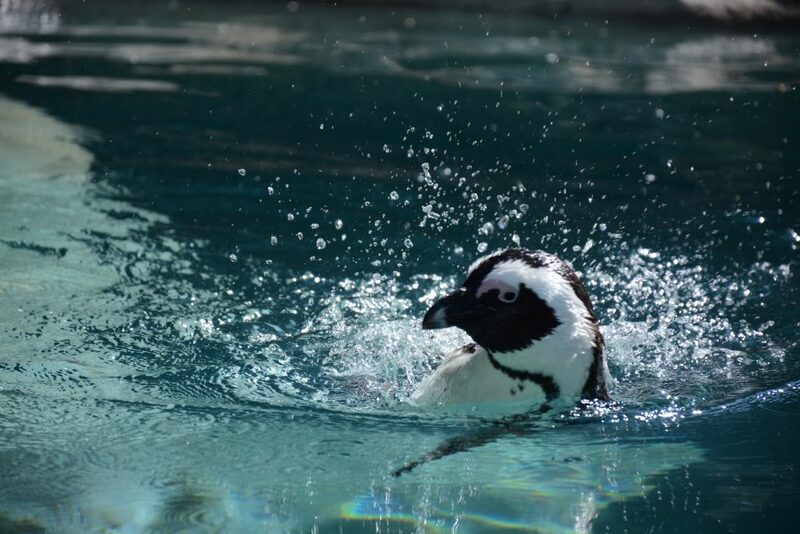 Penguins use their wings and webbed feet to propel and steer as they swim. Unlike many birds which are lightweight allowing them to fly, penguins are heavy, enabling them to swim and dive for food. All penguins are light colored on their chest and dark on their backs. This is an example of “countershading," and serves as camouflage. Swimming in the ocean, the penguin’s dark dorsal (back) side blends in with the dark ocean as seen from above. The light ventral (under) side blends in with the lighter surface of the ocean as seen from below. The coloration helps penguins blend into their environment so predators cannot easily spot them. Although penguins are well adapted to life in the water, they don’t spend all their time in the sea. Penguins come ashore to nest, lay eggs, and molt. Penguins molt or shed their feathers periodically throughout the year. New feathers are regenerated and replace the old. At the Zoo: Smelt, sardines, and capelin (it’s their favorite) trucked in — about 2 tons annually! African penguin populations in the wild have decreased nearly 98% in the last century! Wild African penguins face threats including plastic pollution, over fishing, human encroachment on nesting sites, harvesting of guano, and oil spills. In the early 1900s, guano (excrement of sea birds) was harvested from the breeding locations. Removal of the guano led to a dramatic reduction in nesting sites, which then resulted in a significant drop in population due to a reduced number of hatching chicks. In 2016-2017 the Saginaw Children’s Zoo and other AZA-accredited facilities combined to raise funds and install artificial nests to replace the lost guano nests. Scientists are now studying the success of these artificial nests in the field! The South African National Foundation for the Conservation of Coastal Birds (SANCCOB) has rescued many penguin species from oil spills and has rehabilitated them for return to the wild. Also, known breeding islands have been made into nature reserves or national parks. Fences have been constructed to prevent predatory attacks on eggs and young. However, the black-footed penguin is still considered threatened, with approximately 180,000 individuals left in the wild. By working together with other organizations, and with concerned citizens like you, we hope to save penguins from extinction!